Did you know this ramp might go away? I left last night’s performance by Theaster Gates at the Birmingham Museum of Art with what’s become an impossible task. My plan was to write a piece about the most recent version of proposed changes for I-20/59, I-65, and 11th Avenue North. If you need a refresher (or a primer) on the issue, you may want to jump over to the piece talking about last week’s meeting in Norwood. After his powerful piece and the question and answer session last night, it got me wondering about the the deafening silence throughout metro Birmingham as they assume the project isn’t going to affect them. I was thinking about how much getting into downtown will change once the 22nd St. N. ramps (westbound pictured above) are gone. Today is the posted last day for comments regarding the changes – ones that will do its part to effectively stifle burgeoning interest and investment in Norwood, Druid Hills, Fountain Heights, and the eastern edge of Smithfield. According to Nick Patterson’s Weld for Birmingham cover story, Brian Davis at ALDOT isn’t necessarily going to ignore those that come in later – but a lot will depend on the number of comments and their significance. The plan derails any attempt to effectively continue expansion of the BJCC and its entertainment district. It also limits revitalization efforts in the Northside neighborhoods mentioned above. They serve an important role in renaissance currently enveloping the city center. I’d argue it’s a lot easier to demonstrate a need for long sought after amenities like grocery stores and drugstores when potential developers can point to additional rooftops less than two miles away as possible customers. Realize this project, one currently slated to take three years, will also change traffic patterns in the city center – potentially causing additional issues as you go from north to south – even as it temporarily improves the flow of traffic through the region on the Interstate. I’m thinking specifically about the 11th Ave. N. modifications. They will create what amounts to a limited access road enabling folks to pass through in cars instead of stroll along a redeveloped area benefiting the city’s tax base and ensuring continued investment north of the Uptown entertainment district. Think about how these changes will affect the morning rush hour. How about evening rush hour traffic? Now, think about that traffic as folks attempt to get to the BJCC with several events taking place at the same time? This is the part of the metro area that’s seeing record attendance at the newest ballpark in all of baseball. This is the one that epitomes the significance of the medical industry as an economic engine for the state as Viva Health plans to raise its name atop the former Regions Bank headquarters. Perhaps it would have made sense for ALDOT officials to pay attention to the comprehensive plan process already well underway when the agency held its second public involvement hearing in July. That said, It’s a lot easier for them to use the property they already control instead of attempting to move the Interstate from its current position. Imagine what happens if you’re driving north on I-65 had to deal with an extended Malfunction Junction – an interchange for I-20 at Finley Blvd., one at I-22, and finally at the looming specter of implied progress known as the Northern Beltline? It’s not a pretty sight, is it? The alternative route wouldn’t be much better as traffic along Carraway Blvd. will see an increase regardless and those who’d be looking to avoid that potential jumble would have to consider growing populations in Gardendale and Fultondale. I’ve had conversations with several people who didn’t know the ramps were going away. They were wondering how something like this could happen. It’s something you’d think state transportation officials would have considered before deciding to create more problems as a result of listening to request to look at alternatives to simply replacing the existing decking along I-20/59. That proposal wouldn’t remove the frustration of an implied boundary between the central business district and the BJCC property. It wouldn’t be creating this long-term morass instead of looking at a compromise that actually listens to the concerns of the entire Birmingham region. We’ve got to fix our own problems – so long as Montgomery lets us. We have so much excitement currently captivating the hopes and dreams of residents who’ve long thought it would never happen for Birmingham. It’s weird to think a proposed solution to what is necessary evil of becoming a city built primarily for cars could have a chance to slow it down. 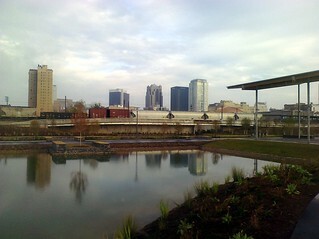 I went for a run recently at Railroad Park – the newness of being able to say that still hasn’t quite worn off yet. I tend to stay on the cushioned portion of the trail circling the four-block urban oasis. I decided I’d stop at the stairs that take you down to the portion of the trail that leads you along the lawn before rising again. It’s approximately where Mayor Bell’s bridge would connect 16th Street North with the park and Southside. After I stopped thinking about how crazy it would be to run through the potential foot traffic, I started wondering what other reasons there could be for constructing this bridge – provided the feasibility study recently approved by the Birmingham City Council says it makes sense and the funding sources are identified and tapped. It’d be nice for tourism, but there are some more practical reasons that can be shared with the community that speak to its long term effects. A symbolic gesture towards the future. Yes, this is the case already being presented by its proponents. Next year the spotlight will be focused on Alabama’s Magic City as people from across the country and around the world look to see what’s changed since September 1963. There will be just as many wondering who’ve never paid attention before wondering what’s happening in this city. Even though it wouldn’t be finished in time, it would be the type of civic project that could be pointed to when asked how things are progressing (though Railroad Park and the baseball field would do a pretty good job on their own). That’s nice, but it’s probably more of a symbolic gesture for the region’s residents than it is for outsiders. Despite the best efforts of some locals, the days of the city’s central business district alone serving as the city’s downtown is over. It is “greater downtown Birmingham” nowadays, and it includes Southside. If we’re not going to be able to get an interstate sunk, we’re still going to want to go over something to claim success of truly connecting our city – and showing what else is possible as these cracks continue to be repaired. It also gives us a way to hearken images of the Walnut Street Bridge in Chattanooga as we cross our “river” running through the center of town (I know that’s running through some minds out there, admit it). The UAB/Bridge to the future angle. The state’s largest employer occupies a significant portion of the property south of the railroad tracks and a concerted effort needs to be made to encourage those associated with UAB to travel just a little farther north. This becomes much more important as people begin to realize how much land is available for redevelopment in the area known as the Entrepreneurial District – a portion of the city center with an easternmost boundary of 16th Street North. As efforts begin to encourage additional, denser development of the area, you’d love to offer them a really cool way to get to those games in addition to giving students and employees a reason to head towards downtown on foot – and thereby providing additional numbers to consider when attracting new businesses. I’m really not saying we should or we shouldn’t do this bridge; I’m asking folks to be willing to look at several reasons for the project and to start having slightly deeper conversations about it and everything else you hear about going on in town right now. We already seem to be building a bridge to somewhere for this city. It’d be nice to start taking a look at just where it can possibly go and where it can take us once we’ve built it. This study is the latest step in that movement. I just offered up three of the crazy reasons I thought of just standing there. Perhaps you’ve got some others (or maybe you think mine are silly). If so, share those thoughts and ideas below. A drive along 1st Avenue South heading east contains a significant yet subtle development for those able to stop and take a look. You’ll notice the absence of rails and ties both in the area known as the 1st Avenue Cut between 20th & 24th Sts. and between 28th and 32nd Sts. A quick look at Birmingham’s GIS map shows most of the property in question being held by CSX. If you can’t tell, I started getting that nagging feeling again (you may have seen what happened earlier this week when that starts), and for some pretty good reasons. The parcels in question have been identified on several occasions as essential for the “Plan A” expansion of Railroad Park. This would eventually connect the existing park between 14th and 18th Streets South and the property sitting on the northwest corner of 1st Ave. S. and 18th St. that served as the focus of “Prize 2 the Future” contest to Sloss Furnaces. The native New Yorker who reads way too many online publications from there every morning remembered the transportation company had already agreed in principal to donate the property necessary to complete the city’s High Line back in late 2011. They donated the property developed as the first segment of the park back in 2005. They also have a history of donating property across the country to recreational projects and those that focus on alternative transportation solutions. Attempts were made to hear the reason for the track removal from CSX via email last week; there has still not been a response. It doesn’t hurt that by removing the track they’ve enabled the city to be able to claim that this project is shovel-ready for development as part of the Jones Valley Corridor. It’s considered an integral part of the Red Rock Ridge and Valley Trail System unveiled earlier this year by the Freshwater Land Trust. This becomes significant when you realize they’re going to announce what projects across the country have been awarded TIGER grants pretty soon – even sooner than some may realize. A bid was submitted for this round to help “jump start” some area projects; it’s the second attempt to secure these federal funds to assist with the greenway initiative. There’s also the amount of activity currently taking place close to 32nd St. and 1st Ave. S to consider. We’re anxiously awaiting more information about the upcoming groundbreaking for Sloss’ new visitors center, a project many years in the making. Those who driving by IMS‘ properties close to Sloss’ entrance notice Appleseed Workshop signs up and a significant transformation underway to make this section of town resemble the master plan the company unveiled a couple of years ago for the Sloss Business District. When you consider the demand for the monies awarded is far exceeding the supply, the cumulative effect of all of these things happening at once suddenly gives you hope for our chances of being awarded funds. Even if it’s not awarded, there’s been a shift in momentum for this area of the city – one that’s sure to pick up steam. It’s a perfect opportunity to focus on the concept of accentuating the city positive I talked about on here a couple of years ago. André Natta is the station master for bhamterminal.com. UPDATE: The plan and its name – The Red Rock Ridge & Valley Trail System – was announced this evening – along with a website that allows you to see the entire plan. It’s safe to assume that this evening (Tuesday) a large crowd will be gathered in the Steiner Auditorium at the Birmingham Museum of Art. They’ll be there to witness the unveiling of the Freshwater Land Trust’s “Our One Mile” plan. They’ll also be among the first to learn the name of the system – the result of a contest held at the end of last year. The level of excitement filling the space will undoubtedly be insane. Well, this is where I bring up one more thing to keep in your mind as we get started – the under-construction Greenwood Park. Folks that normally travel along I-20/59 westbound that have wondered why all those bulldozers have been active just after you pass Tallapoosa St., here’s your reminder. This new green space could be viewed as a trail head for the 26-mile Village Creek Greenway, a project viewed by many as an integral part of the Our One Mile initiative. You’re starting to connect the dots, aren’t you? These first two have been brought up before, courtesy of the Norwood Plan developed by Auburn University’s Urban Studio back in 2006. The park would connect with the greenway, which could hypothetically have another touch point along Vanderbilt Road. That connection would just happen to be about ¼ of a mile from the easternmost edge of Norwood Blvd – and be right about where that photo I told you to pay attention to at the beginning of this piece was taken. Assuming there’s access to the greenway at Vanderbilt, it’d only be a little over ½ a mile along the creek to get to the edge of Greenwood Park that touches Coosa Street. I’m not even focusing on the fact that this could potentially bring a whole new group of users over to Patton Park on the other side of the Interstate. 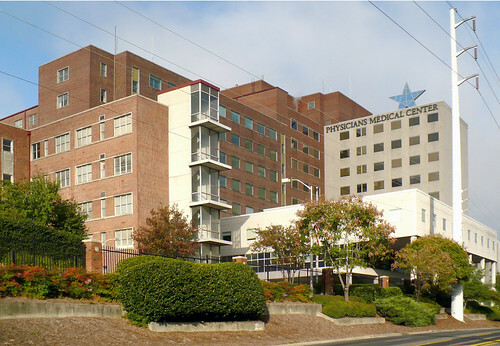 It means more once you include the recent donation by Red Diamond – their former headquarters on Vanderbilt Road (valued at approximately $2 million in an online listing) to the Birmingham YMCA. The distance from the edge of Norwood Blvd. to 1701 Vanderbilt Road is approximately half a mile. If you’re running, this means you’re probably no more than 5-7 minutes away. It could be the jump start needed to encourage potential investors to take a look at the section of Norwood referred to by some in the neighborhood as “the bottoms” as an option for renovation projects. It’s safe to say there would be several young professionals that aren’t looking for a mortgage but instead for an inexpensive place that’s relatively close to downtown and some of those intangible quality of life benefits. It might also lead to some changes in traffic flow in the area surrounding all of these things – changes that could influence whether or not we see significant development along 12th Avenue North, particularly the eastern end of the street. The western edge may already see some influence from a entertainment district that will soon go from dream to reality in the coming months. It’s just an example of what happens when the dreams of a community are thought through and given the potential to be realized. It’s all out there – including pieces like Ruffner Mountain, Red Mountain Park, and the (soon-to-be-added-onto) Shades Creek Greenway. Now it’s simply time to see if folks want to connect those dots all the way. Many of these thoughts about the northside are assuming that the YMCA decides that it can move ahead and make the additional improvements to their newest piece of property – suddenly the largest of the properties held by the organization. It also depends on how empowered and motivated the citizens of metro Birmingham get to make this greenway plan presented this evening a reality. This greenway – and many projects like it currently in the pipeline – are probably what Volker may have been thinking of as he spoke. It’s now up to the general public to lead the leaders to the city they want, rather than have a disjointed one given to them instead. Maybe coming out to the event tonight’s a good first step. Where will the road lead Carraway, Lovelady? Something that seems to escape the minds of many of the people from all sides of the continuing debate about a future use of the former Carraway Hospital complex is the significance of 24th St. It may mean nothing to those who don’t normally find themselves exploring the Magic City during business hours, but it should. See, 24th Street is one of the few that connects the area near the entertainment complex with points east. Specifically, you can drive 24th Street from the back side of the Carraway property and eventually you’d end up on Montclair Road (formerly U.S. 78) and eventually Crestwood Boulevard (the current U.S. 78). This also means it’s one of the only non-Interstate routes out to The Shops at Grand River (though that’s the topic of another post…). A city that has a love/hate relationship with highways may not see the immediate impact of this situation. The same cannot be said for a city working to become a 21st century hub for the southeastern United States. If you don’t believe there are folks working towards that end, I’d invite you to check out the progress of the Birmingham International Airport modernization and expansion as well as the continued planning underway for a transportation hub downtown. It’s a fun view for that split second – the one that you get to enjoy as you reach the crest of the road right after Montclair becomes Country Club (which is before it becomes Pawnee and then Niazuma) as it brings folks into the city of Birmingham. The nighttime approach into the city center has become even more colorful with the recent addition of Children’s Hospital‘s newest building. The street immediately turns into 26th Street South as you pull alongside Caldwell Park and the Virginia Samford Theatre. The fork in the road ahead has you follow what is now 24th Street South through Southtown and towards points north. Those who frequent this route have noticed that the Citgo gas station on the southwest corner of 24th Street and 6th Avenue South has recently re-opened, complete with a grocery. Folks who follow the happenings of the city’s Design Review Committee are probably waiting with intense anticipation as WorkPlay finally opens itself out onto 23rd Street with its new patio. Once you cross the bridge into what’s long been known as the “loft district” you meet an opportunity to convert Jeremy Erdreich‘s architecture firm into anything right now, including perhaps another restaurant to take advantage of the success that’s been enjoyed by the likes of Urban Standard, Rogue Tavern and (already) El Barrio. As you pass the always full parking lot of the city’s main U.S. Postal Service branch on your east, Fife’s is serving food on your left while the Stonewall Building waits for a proper tenant. The shell of the former Powell School waits too – and it is getting cleaned out in anticipation of its next act. Phillips Academy sits on your left as you drive through the with Jones Valley Urban Farm just a couple of blocks over to the east. As you come out from under the Interstate you notice the entertainment district and its Westin Hotel centerpiece rising to the west. If you continue up the road you eventually run into the back end of the former Carraway Hospital property (after passing by a pharmacy and medical office that serves the surrounding community). I’ve written before about the significance of the Carraway property as it relates to I-22 and I-65. The fact that it’s a terminus for one of the few eastern corridors for the region should probably be an even more important argument made. Especially since I didn’t necessarily point out everything that’s currently going on. Depending on which piece of property you look at, the traffic count for the Montclair portion of the passage ranges from 11,000 to 17,000 a day. It’s easy to understand why that’s the case, especially when you realize that even when (or if) Trinity makes the move to Highway 280, there will be continued traffic thanks to the folks living in Crestwood South, and folks frequenting businesses in Crestline Village and the area surrounding Eastwood Village. Those trips are already commonplace, including ones into the city center for work. If people are in the mood to avoid the Interstate to get to the Marketplace, or if one of those proposed $22 million developments get built, the number of cars will no doubt only increase. The eastern edge of this development was once considered important – the glow of the signs and lights along Crestwood Boulevard as I approached Birmingham from the east for my first visit back in the late 90s was a clear message to all those that questioned the city’s potential. For the Carraway terminus of this stretch of road, I’m now left wondering what folks driving to and around the entertainment district will see as a result of wanting to do some exploring (read: searching for a parking spot). Time will tell if others are thinking about this too.